Residue generation from the combustion of coal decreased in the 2002-2008 period mainly due to a higher quality of lignite. The largest source is the Šoštanj Thermal Power Plant contributing over 80 % of residues. Only 7 % of residues are disposed, while the remainder are mostly used as filling material in mines and in the production of cement and concrete. 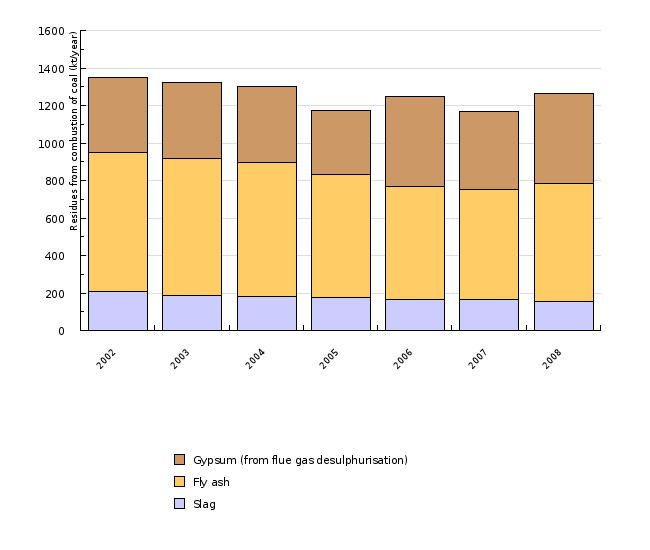 The indicator shows the quantity of residues from the combustion of coal classified by type (gypsum, fly ash and slag) and source (the Ljubljana Combined Heat and Power Plant, the Trbovlje Thermal Power Plant and the Šoštanj Thermal Power Plant) of residues as well as their further utilisation. Environmental Agency of the Republic of Slovenia, 2009. Environmental Agency of the Republic of Slovenia, Jožef Stefan Institute, 2009. - waste has to be recovered if there are technical possibilities and possibilities of further utilisation of recovered waste or its components. The quantity of residues is indirectly affected by the Kyoto Protocol, the Directive on National Emission Ceilings for Certain Atmospheric Pollutants and other rules through stricter environmental requirements and reductions of allowed emissions, as they have a direct effect on reductions in the use of coal. The quantity of coal combustion residues from energy production is a good indicator of the use of coal, its quality and the level of used flue gas cleaning technologies. Their environmental impact depends on the heavy metal content of coal. The main environmental hazard is the leakage of heavy metals from the residue into the soil and groundwater. Coal combustion residues can be disposed, used as additives in the production of cement, for the fortification of roads and embankments, etc. Even if residues are utilised (construction material), leakage of heavy metals and groundwater pollution can occur. In the future, this potential environmental hazard needs to be researched in detail. In 2008, there were three coal-fired thermal power plants in Slovenia – the Šoštanj Thermal Power Plant, the Trbovlje Thermal Power Plant and the Ljubljana Combined Heat and Power Plant. The Šoštanj Thermal Power Plant uses domestic lignite, the Trbovlje Thermal Power Plant domestic brown coal, lignite and imported Czech coal and the Ljubljana Combined Heat and Power Plant imported Indonesian brown coal. The domestic coal types are of a lower quality, with calorific values between 10 and 12 MJ/kg, have a high sulphur content (1.4 % to 2.5 %) and are high in ash. The imported Indonesian coal is of a high quality, with a calorific value of approximately 18 MJ/kg and is low in ash and sulphur (0.1 %). The imported Czech coal is also of a higher quality than the domestic one, as it has a higher calorific value (approximately 16 MJ/kg). The Šoštanj Thermal Power Plant is the largest of all power plants and in 2008, it used 4037 kt of coal for electricity production. The Trbovlje Thermal Power Plant used approximately 563 kt and the Ljubljana Combined Heat and Power Plant approximately 460 kt of coal. There are two desulphurisation devices for treating SO2 flue gases installed in the largest units of the Šoštanj Thermal Power Plant, while a desulphurisation device was installed in the Trbovlje Thermal Power Plant in 2005. These facts clearly show the shares of different sources of coal residues. In 2008, the Šoštanj Thermal Power Plant was by far the largest source (83 %) followed by the Trbovlje Thermal Power Plant with 16 %. The Ljubljana Combined Heat and Power Plant contributed only 1 %. As regards types of residues, fly ash prevails, contributing 50 % in 2008. It is followed by gypsum (from flue gas desulphurisation) with 38 % and slag with 12 %. In the 2002-2008 period, the total quantity of residues decreased by 6.5 %. 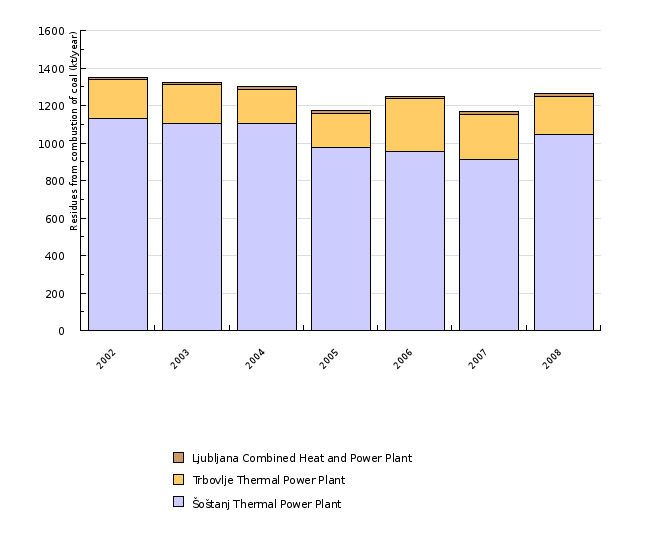 The most notable reduction of quantity happened in 2005, when the quantity of residues generated by the Šoštanj Thermal Power Plant decreased by 12 % from 2004. 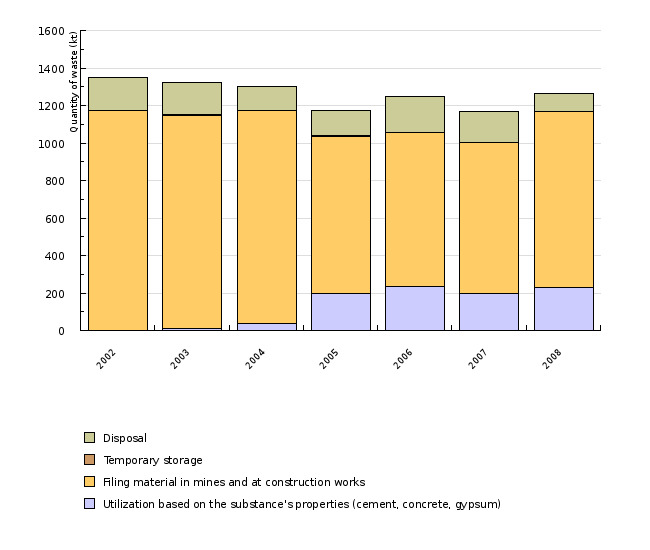 In 2006, the total quantity of residues slightly increased, decreased in 2007 and again increased in 2008. The increase in the amount of residues resulted from the increase in the Šoštanj Thermal Power Plant, while quantities generated by the Trbovlje Thermal Power Plant decreased due to the use of a higher quality coal. The higher amount of residues generated by the Šoštanj Thermal Power Plant is the result of the lower quality of fuel (ash content in coal in 2007 was 13.7 % and 14.9 % in 2008). As regards waste management, residues are mostly used as filling material in mines. This is due to the majority of residues generated by the Šoštanj Thermal Power Plant (90 % in 2008) being used to prepare a stabilising agent used to stabilise mine subsidence in the Velenje coal mine. The Šoštanj Thermal Power Plant sells the remainder of the residues (part of ash and gypsum) for further use in the production of concrete and cement. In 2008, the Trbovlje Thermal Power Plant deposited 40 % of residues in the Prapretno landfill site and the remainder was sold as filling material to be used in the Hrastnik coal mine or for further use in the production of concrete. The entire quantity of residues from the Ljubljana Combined Heat and Power Plant is deposited at the Barje landfill site where it is used to stabilise the ground. Deposited residues represent 7 % of total residues, residues used in mines 75 % and residues used in the production of cement and concrete 18 %. In the future, it is expected that the quantity of residues will be reduced, as the use of coal will decrease due to it being exchanged for natural gas following the technological refurbishment of the transformations sector (the Trbovlje Thermal Power Plant and partially also the Ljubljana Combined Heat and Power Plant). The disposal and management of coal combustion residues is regulated by waste legislation. The most important documents are the Decree on Waste Management (Official Gazette of the Republic of Slovenia, No. 34/08) that specifies the list of waste and hazardous waste by categories as well as mandatory rules of management and other conditions for the collection and transportation of waste, its processing, recovery and disposal and the Decree on the Landfill of Waste (Official Gazette of the Republic of Slovenia, No. 32/06, 98/07, 62/08). Indirectly, by pressuring for a reduction in the use of coal, environmental legislation and policies aimed at reducing atmospheric emissions also influence the quantity of residues. These indirect instruments include the Kyoto Protocol, the Directive on National Emission Ceilings for Certain Atmospheric Pollutants (Official Gazette of the Republic of Slovenia, No. 24/05), the CO2 emissions allowance trading scheme, etc. Objectives summarised by: Uredba o ravnanju z odpadki (The Decree on Waste Management, Official Gazette of the Republic of Slovenia, No. 34/08). Source database or source: The Environmental Agency of the Republic of Slovenia (data provided by the Šoštanj and Trbovlje Thermal Power Plants and the Ljubljana Combined Heat and Power Plant. Data administrator: The Environmental Agency of the Republic of Slovenia – Brigita Šarc, contact persons in thermal power plants: the Šoštanj Thermal Power Plant – Evgen Jurič, the Trbovlje Thermal Power Plant – Mihael Vengust, the Ljubljana Combined Heat and Power Plant – Irena Debeljak. Methodology and frequency of data collection for the indicator: Data on generated residues and waste management collected by the Environmental Agency of the Republic of Slovenia by means of ODP forms were used for the indicator. The data are prepared (collected) on an annual basis and on the basis of reports as submitted on ODP forms. Coal combustion residues are classified into the following groups: 100101 bottom ash, slag and boiler dust (excluding boiler dust mentioned in 100104), 100102 coal fly ash, 100105 calcium-based reaction wastes from flue-gas desulphurisation in solid form, 100107 calcium-based reaction wastes from flue-gas desulphurisation in sludge form (including mud and sediments). In the ODP form, waste management is classified into the following categories: internal recovery, internal disposal, temporary storage, quantity of waste presented to collectors, quantity of waste presented to recoveries, quantity of waste presented to disposers, quantity of waste sent abroad, waste disposal, etc. In order to achieve an exact definition of what this means, phone conversations with all three thermal power plants were conducted and waste management explained. Data are for the 2002-2008 period, as data have been collected in this manner only since the year 2002. Data processing methodology: The share of residues from different sources and according to residue types is calculated as the ratio of residues from an individual source or type and the total quantity of residues. - Advantages and disadvantages of the indicator: Officially reported data have been used to calculate the indicator. - The Ljubljana Combined Heat and Power Plant, 2009: the Ljubljana Combined Heat and Power Plant Website. - BilTEŠ 2008 - Poročilo o proizvodnji, vzdrževanju in ekoloških obremenitvah okolja TE Šoštanj v letu 2008 (The Šoštanj Thermal Power Plant, 2009: Annual reports. Report on the Production, Maintenance and Environmental Strains for the Šoštanj Thermal Power Plant in 2008). - The Trbovlje Thermal Power Plant, 2008: Letno poročilo za leto 2008 (Annual Report 2008). - EEA, 2009: List of Wastes (formerly the European Waste Catalogue).